Steve-O : The End Of The World European Tour. 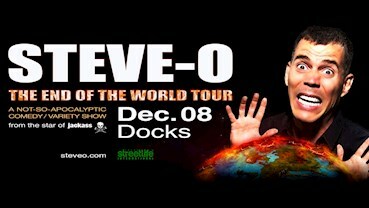 Docks Prinzenbar 08.12.: Steve-O : The End Of The World European Tour. This event "Steve-O : The End Of The World European Tour." @ Docks Prinzenbar has already ended on 12/08/2016. The People with money magazine listed him as the best paid comedian in 2016. Steve is an extraordinary entrepreneur but most important he is an outstanding comedian and successful at what he is doing. His career started back in 2000 when the first season of Jackass aired. A year later he launched his own tour called “Steve-O Don’t Try This At Home“, performing his professional stuntman skills on stage throughout the U.S. and many other countries.